Fully automatic operation with water level cut-off and Auto-start / Auto-off. The Aqua Supreme 18 Ltr 14 Stage Water Purifier is a wall-mounted water purifier has a storage tank capacity of 18 litres with 15 l/hr. filtration flow capacity. and is completely safe to use as it is made of food-grade ABS plastic. A detachable storage tank in this purifier allows easy cleaning. This water purifier purifies water in 14 different stages. The Reverse Osmosis function filters out salinity in water while retaining essential minerals. The UV filtration method allows water to pass through high-grade glass wherein microbes are killed by exposing it to UV light. The Ultra Filtration removes all microbes suspended in water. 2nd Stage**: Sediment Filtration: removes suspended particles, dust and other visible particle from water. 3rd Stage**: Activated Carbon: removes chlorine, chlorine smell and restore the natural color of the water. 4th Stage**: RO Membrane: removes hardness of the water, filter out other impurities of the water. 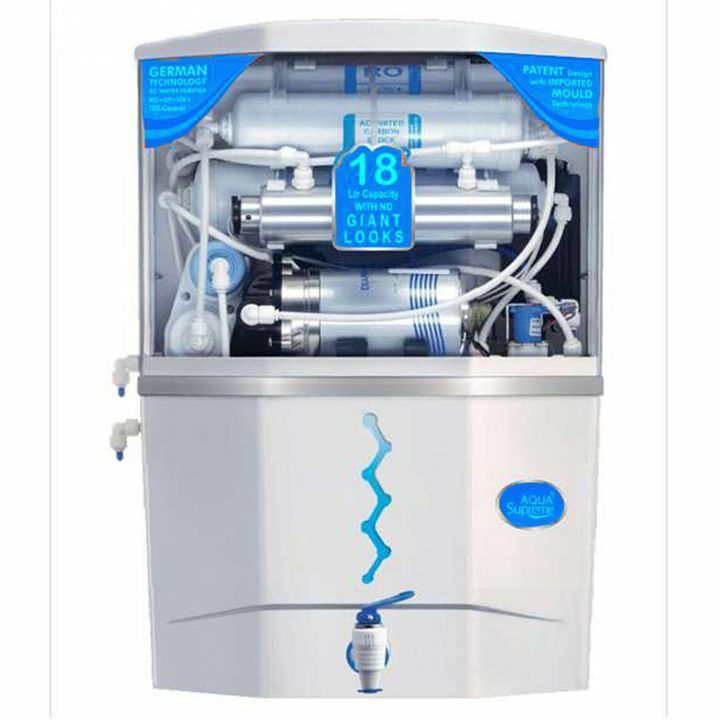 This water purifier features fully automatic operation with Auto Start and Auto Shut Off and ensures safe drinking water. It also has a water level cut-off that helps in overflow protection. This appliance has a voltage requirement of 110-220V.